Build a high-strength core faster with SuperCure, light activated composite core buildup material. Inject direct from the SuperCure syringe tip into the tooth. Light activate to a dentin-like hardness for immediate prep. Easier, faster, better. SuperCure is available in two high performance formulations. 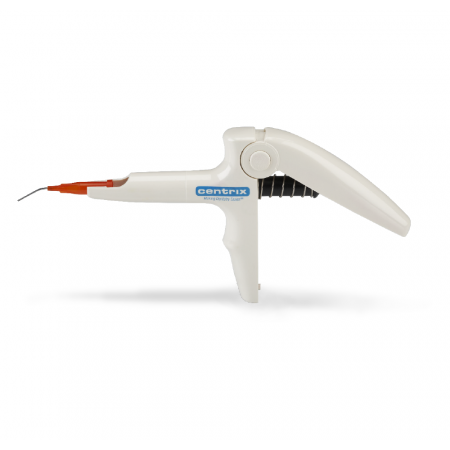 Original SuperCure - with barium borosilicate glass filler cuts like dentin. SuperCure-Q - is reinforced with quartz glass filler to cut harder than dentin. 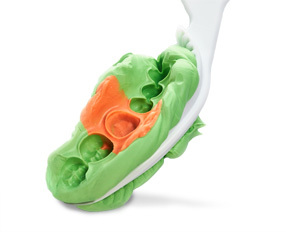 Both formulations are packaged in Centrix exclusive direct-to-the-tooth unit-dose tips (.25gm or .50gm) with enough material to meet the needs of most buildups. Just place a tip of SuperCure light-activated core buildup material in your Centrix syringe and inject. There’s no mixing, no wasteful automix nozzles and no cross-contamination. SuperCure stacks beautifully, without slump, so matrices or coreforms are not required. Does SuperCure require the use of a matrix or core form? No. SuperCure does not slump and therefore does not require a matrix or core form. How should SuperCure be applied? It is recommended that SuperCure be applied in 2mm increments. Yes. The tooth must be etched prior to using SuperCure. What bonding agent is needed with SuperCure? SuperCure is compatible with all light-activated bonding agents on the market. Can SuperCure be used to cement a post? It is not recommended that light-activated core buildup materials be used to cement posts. Can eugenol materials be used AFTER SuperCure is used? Yes. Eugenol containing material can be used AFTER SuperCure is fully cured. SuperCure cuts similar to dentin and is easily cut with a standard diamond or bur. What syringe would I use to place SuperCure? DO NOT USE IN THE PRESENCE OF EUGENOL! Do not use on patients with known allergies to Bis-GMA, benzoyl peroxide or other compnents. Isolate the tooth with a rubber dam or cotton rolls. Remove all decay and existing restorative materials, including eugenol cements or sealers. Place an adhesive bonding agent system for dentin that is compatible with light-activated composites. Follow manufacturers' specific instructions for use. Remove cap (or sheath) and insert the SUPERCURE® tip into a Centrix C-R® syringe.Test flow by expressing a small amount of material onto a pad. Inject a 2mm layer of material into the prep, over the surface coated by the bonding agent. Light-activate for 20 seconds, using any halogen, LED or PAC light source. Place a second layer on top, not to exceed a thickness of 6 to 8mm. Light activate for 40 sec. Cut and prep the core, using water-cooled diamonds or burs. Remove used SUPERCURE® tip from syringe and dispose of properly. Sterilize or disinfect syringe gun after use. Store away from light! Do not freeze! Do not use on patients with known allergies to Bis-GMA, benzoyl peroxide or other components.